At Valparaiso University, student-athletes are afforded chances academically that are found at few Division I institutions. Rather than being told what majors are available for student-athletes, Valpo works with students to discern their chosen field of study. Say a student wants to be on the softball team and study to become a nurse? Or play men’s basketball while majoring in bioengineering? At Valpo, everybody works together to make those combinations a reality. Not only are 400+ student-athletes competing at the Division I level and dedicating time in practice and in the weight room to be successful, they’re also taking advantage of all the educational opportunities available to them at Valpo, and they’re enjoying great success in the classroom while doing so. In fact, 286 of Valpo’s student-athletes earned either Missouri Valley Conference or Pioneer Football League Academic Honor Roll accolades in 2017–2018. And perhaps no Valpo student-athlete took greater advantage of all that the University has to offer, both in competition and in the classroom, than Grace Rogers ’18, who graduated in May 2018 as an actuarial science and business analytics double major. Grace stepped on campus as a freshman in fall 2014 and made an immediate impact on the Valpo women’s soccer program, appearing in 15 games and starting 10 times as a freshman as Valpo captured the Horizon League regular season and tournament championships and advanced to the NCAA Tournament for just the second time in program history. She was a part of a defensive unit that season that ranked fifth nationally in goals against average. “Anyone who was on the team in 2014 will tell you that going undefeated in the Horizon League and winning regular season and tournament championships was an unparalleled experience and forever a favorite memory,” Grace says. After playing in a reserve role as a sophomore, Grace returned to the starting lineup as a junior and finished the 2016 season with one goal and four assists. But that was just a warmup for a stellar senior campaign, as she started all but one of Valpo’s 19 matches in 2017 and set new program assists records, both for a single season (seven) and for a career (15), from Valpo’s back line. Grace was named to the Honorable Mention All-Missouri Valley Conference team at the conclusion of the season. Beyond the numbers, Grace meant so much more to the women’s soccer program, and likewise, the women’s soccer program helped shape Grace. However, Grace’s accolades with the women’s soccer program are only part of her legacy here at Valpo. Through her studies in the College of Business, Grace committed herself just as much to her academics as she did athletics, if not more so, and it showed in the end. Grace graduated with a perfect 4.00 cumulative grade point average. 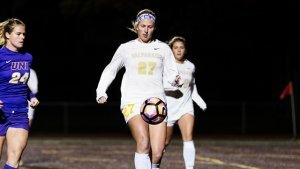 She received the Valparaiso University Alumni Association’s College of Business Distinguished Service Award and was one of just 11 Division I women’s soccer student-athletes in the nation to earn First Team Academic All-American honors. Between the work in the classroom and on the field, Grace was also able to get a jump-start on her career path during her time at Valpo. She completed an internship in summer 2017 as an actuarial intern with Thrivent Financial, a position that led directly to her current job as an actuarial analyst for Thrivent. Grace also graduated well on her way to professional accreditation, as she attained three Validation by Educational Experience credits and completed two of the six actuarial exams necessary to earn Associate of the Society of Actuaries designation. But Grace wouldn’t have been able to be nearly as successful in the academic realm at Valpo without the support system of her women’s soccer family. It was a two-way street for Grace as well, as not only did the support from her coaches and teammates assist her in her academic successes, but she found her professors always willing and able to help out and be accommodating. It’s that willingness of all involved, whether on the athletic side or the academic side, that allows Valpo student-athletes to be successful in all their endeavors during their time on campus. Grace truly excelled on and off the field throughout her four years at Valpo, and she stands as a shining example of what Valpo student-athletes can accomplish, both during their time on campus and following graduation.